This Chickpea Salad combined with bulgur wheat as well as the remaining ingredients is a very healthy meal on its own, even if it is called a salad. Chickpeas are one of my favourite dried legumes and one of the most healthiest as they are prized for their high protein and fiber content. It is packed with amino acids necessary for the human body. When it comes to creating a new recipe, I just follow my instict, which fortunate enough for me, it always works. I’ve made many chickpea salads over the years and today I wanted to make something totally new. I knew the recipe would work just as well with pasta, rice or quinoa as I have used it in the past but never used bulgur with chickpeas and never combined bulgur with pesto. However, if you choose to substitute with any one of these, each one would require a different way of cooking. Another dilemma I had was what kind of pesto to use. I had two kinds in the deep freezer: mint pesto and coriander (cilantro) pesto with kafkalithres and myronia. Although I knew that mint would work very well with feta, I decided to go with the coriander pesto. I know that there are a lot of people who hate coriander, especially here in Greece, but as I grew up eating coriander in salads in Cyprus, I love it. I also love the other herbs I used in the pesto such as kafkalithres, myronia and parsley. In this pesto I had added almonds but, as a rule, I never add cheese when I deep freeze it. 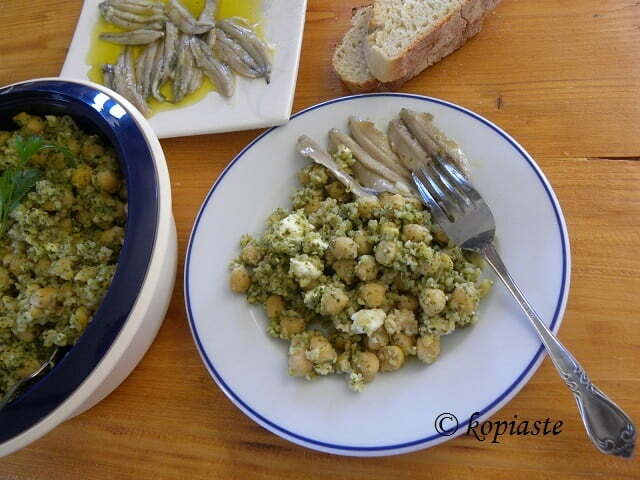 Feta is a staple in all Greek households and although I had graviera, kefalotyri and halloumi, I preferred to use the feta, which practically melted in the dish, and together with the pesto, it was absorbed by the bulgur, adding so much flavour to the dish. Although I have never used canned chickpeas, I am sure you can still make the recipe if you want to use canned chickpeas. I don’t know how much fluid there is in a can but surely it will be less than a cup, so add some water, until you have 1 cup, which heat in order to dissolve the bouillon. If you use homemade broth, that would even be better, so just heat a cup and add to the bulgur. Next day drain, add fresh water and boil. Skim off any foam forming on top with a slotted ladle, until no more is produced. Cook until they are almost soft. Drain them and put them back in the pot with tap water. Rub them with your two hands in order to remove some of the chickpea peels. By adding water to the pot the peels float, so put a colander in the sink and drain whatever floats. Put more water to cover them and bring to a boil. Add salt and vegetable bouillon and cook until the chickpeas are soft. Drain the chickpeas in a bowl and reserve 1 cup of broth. Put the chickpeas back in the pot, add the bulgur wheat as well as the broth, mix and when it comes to a boil turn off the heat. Cover the pot with a lid. In 10 – 15 minutes the bulgur will absorb all the broth. Add the pesto and mix. Crumble the feta and mix again. I love serving them with fresh, marinated anchovies! Delicious! This is something fr me. That sounds delicious Ivy. I adore chickpeas and I love pairing them with some feta too. The pesto here is a masterful touch. 3 of my favorite things – chickpeas, feta and coriander – in one great dish. We’d all love this in our house! Sometimes the best things are the most simple and I know this could be a meal in itself. Looks healthy and delicious, I love pesto and chickpeas so combining the two is a must try. Aren’t chickpeas supposed to be packed with proteins? I’m searching for new sources of protein and I think this recipe will work perfectly. Fantastic and tasty, this is a healthy recipe, thanks so much!